We have added in the appropriate corrections to a Geoid if wanted. If this option is ticked the appropriate correction is applied. 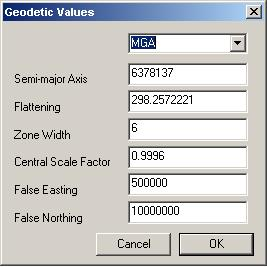 At present we have MGA, and ISG predefined as well as a Custom option for other geoids. The precision stadia type is a new type which is included as well as the “Electronic Stadia” type that has been included for the last 18 years plus. Unless you need the geoid corrections or a least squares adjustment we suggest that you continue to use the existing version. From the entry menu you will see the new option precision stadia. Simply click on it. Select new or existing as you always have. If you only have an existing “Electronic Stadia” file then this can be brought up as well. Click on the browse button and select a file type as stad – . The program will open up the existing stadia as a precision stadia display. On saving the file a new precision stadia file is created. The existing stadia file is not affected. 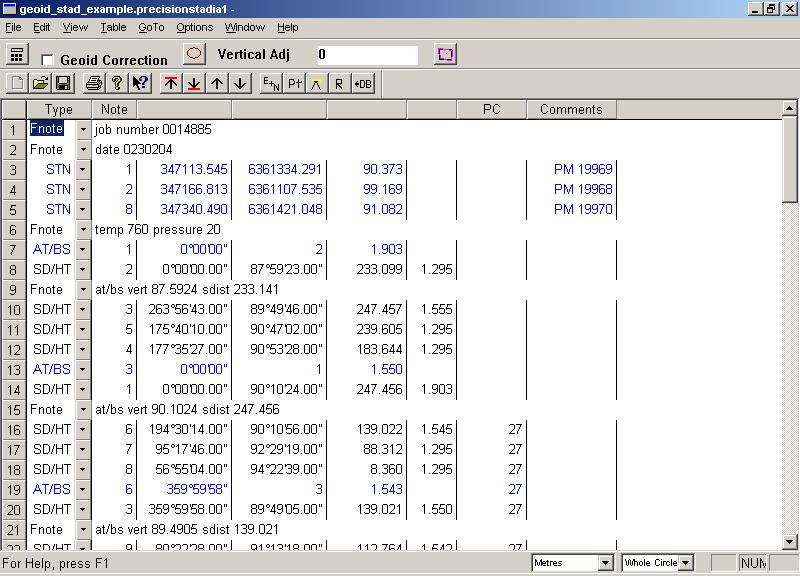 If you point your web browser to ftp.foresoft.com then you can download and save the file geoid_stad_example.cab into your appropriate data directory. Open up CDS and select options. Select the “Restore data” item and browse to the geoid_stad_example.cab file. Restore this data. From the file menu select “open” and browse to the saved file. Select the “db.geoid_stad_example” file and a blank job will open. To bring up the new precision stadia file select “Entry” and then “Precision Stadia”. The following screen will be displayed. The observant ones will notice the new tool bar. The following functions have been added or shown on the toolbar. The tick box “Geoid Correction”. Tick this if you want the calculated coordinates to be corrected to the appropriately define Geoid. For eg MGA, ISG or whichever you select. Vertical refraction value. Leave at 0 for no correction. Least squares adjustment. Click on the two box's icon. By inspection we can see that we are heading in the right direction. Pressing the Least Squares Icon will run Least Squares on the network. First fill in the appropriate values for “distance accuracy” in mm's, “Parts per Million” typically 3 or 5 and “angle accuracy” in secs. Simply press the Continue button and the least squares correction is applied. View the results and if happy create the printable output for your archives. The corrected coordinates are copied back into the precision stadia. Pressing the cancel button will recalculate the coordinates without least squares correction. and a Vertical Refraction correction of 0 sec/Km. We can now store the corrected points into the CDS database.